Pay in Full today @ $69.00 or own it in payments. If you desire a lightening cream that offers accelerated results, then this is the product to choose. The 15X Super Bleaching Body Cream is highly concentrated and with regular use will lighten the skin tone by several shades. The cream is formulated with proven, fast acting ingredients such as hydroquinone, bearberry, kojic acid, mulberry, glycolic acid, niacinamide, MSM, tranexamic acid and licorice. It works vigorously to effectively lighten dark spots and uneven discoloration. We conducted multiple tests and reformulations to develop this advanced formula to ensure that the most discerning user will not be disappointed! Our job is to create products that will deliver visible skin lightening results for those from African, Caribbean, Asian, Indian, Middle Eastern and Hispanic descent. Most skin lightening products are formulated by companies who have no idea what the practice of full body skin lightening is all about. Very few cosmetics chemists truly understand or are willing to take the time to experiment and formulate skin lightening products for darker skin tones. They may create creams using only 1 or 2 common skin lightening ingredients without realizing that such weak creams are ineffective on ethnic skin. There has been a surge of brightening creams on the market as Caucasians have now gravitated to lightening creams to correct sun damaged skin. It is easy for anyone to make a simple brightening cream for Caucasian skin because their intent is to correct minor hyperpigmentation issues and they do not expect to get several shades lighter. ProDerma Light understands the complexity involved in creating effective skin lightening products for ethnic skin, particularly full body skin lightening for dark skin. It is not easy to lighten the entire body. The skin on the body is a large surface area that is prone to darkening due to constant sun exposure. The 15X Super Bleaching Body Cream was carefully created to lighten even darker skin tones. Bearberry is one of the many ingredients that has become more prominent in skin care products today as it has been discovered to have a whitening effect on the skin. Bearberry contains arbutin, which is a form of hydroquinone but is considered safer. Used regularly, bearberry can remove freckles, age spots, discoloration and even the most stubborn pigmented areas of the skin. Tranexamic acid is a peptide that is used to prevent excessive blood loss during surgery. Its skin whitening properties was accidentally discovered but now you will find tranexamic acid in several high end skin care preparations. 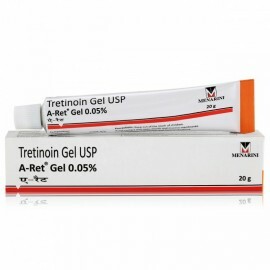 In Asia those desiring whiter skin typically inject tranexamic acid to block melanin synthesis. Most of us would cringe at the thought of injecting ourselves so it is good news that tranexamic acid can be formulated in creams for topical application. It is highly effective at reducing dark spots and providing an overall fair complexion. There are several types of AHAs (fruit acids) but glycolic is undoubtedly the most popular as it delivers numerous skin care benefits. Glycolic acid is able to produce such wonderful results because it has the smallest molecular structure so it can actually penetrate the epidermis and really get to work below the surface of the skin. Glycolic acid treats hyperpigmentation, sun damaged skin, skin discoloration, rough skin, enlarged pores, wrinkles, melasma, oily skin, eczema, rosacea, psoriasis, loss of elasticity, and a host of skin conditions. However, glycolic acid on its own will not lighten the skin tone by several shades. We use it frequently in skin lightening preparations to exfoliate the skin and get rid of the dull, dark, dead skin cells. When the thick, darker top layer of the skin is gently removed, skin lightening creams are better able to absorb and work faster. Without proper exfoliation, skin lightening creams will just sit on the top layer skin and the full potential of the active lightening ingredients will not be realized. Niacinamide, also known as Vitamin B3, is one of those ingredients that can be described as nothing short of amazing! It is a vital ingredient used in many cosmetics preparations as it is gentle on the skin and offers moisturizing, anti-aging and skin lightening benefits. Unlike other skin lightening ingredients, niacinamide does not stop the production of melanin but instead it prevents the transfer of melanosomes to the surrounding cells. 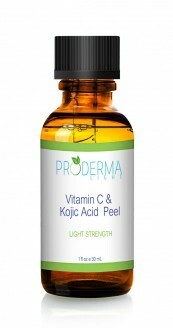 This helps to prevent darkening of the skin and thereby reduces pigmentation. The licorice plant is a legume that is native to southern Europe and parts of Asia. Outside of dermatology, licorice is used to treat various complaints including stomach ulcers, sore throat, bronchitis, cough, and infections caused by bacteria or viruses. In skin care preparations, licorice is now frequently used as a skin lightening agent. Licorice has been proven to inhibit tyrosinase activity and prevent UVB-induced pigmentation. Some researchers (not us) claim that the de-pigmenting efficacy of licorice is greater than that of hydroquinone. MSM is an organic sulfur compound that plays a critical role in detoxification. It is also a beneficial nutrient for bone and joint health as it improves circulation and reduces inflammation. Though it is commonly available in pill form and taken orally, normal ingestion of MSM from dietary sources will not result in noticeable skin lightening. 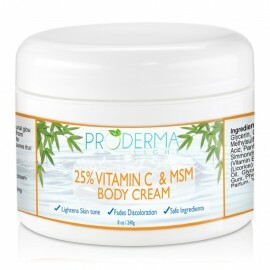 However, topical application of MSM has been proven to brighten the skin tone and promote glowing skin. MSM is highly regarded as a “beauty mineral” as it helps to strengthen hair and nails and treats skin conditions such as psoriasis, eczema, rosacea and acne. On its own MSM is not strong enough to give dramatic skin lightening results but it works well in conjunction with other skin lightening ingredients. Ingredients: Water, Capric/Caprylic Triglyceride, Squalane, Glycerin, Sorbitan Stearate, Behenyl Alcohol, Stearyl Alcohol, Sorbitol, Dimethicone, Hydroxypropyl Starch Phosphate, Tranexamic acid, Butyrospermum Parkii (Shea) Butter, Isopropyl Palmitate, Propanediol, Lactic Acid, Phenoxyethanol, Sorbityl Laurate, Arctostaphylos Uva Ursi (bearberry), Isopropyl Jojobate, Methylsulfonylmethane (MSM), Ethylhexl Glycerin, Jojoba Esters, Glycyrrhiza Glabra (Licorice) Root, Palm Oil, Glycolic Acid, Sodium Hexametaphosphate, Sodium Citrate, Niacinamide, Potassium Hydroxide, Trisodium EDTA, Morus Alba (White Mulberry), Glycine Soja (Soybean) Oil, Kojic acid, Persea Gratissima (Avocado) Oil (Persea Gratissima), Citric Acid, Vitis Vinifera (Grape) Seed Oil, Hydroquinone, Lavandula Hybrida Lavender Oil, Simmondsia Chinensis (Jojoba) Butter, Linalool,Butylene Glycol, Ethylhexylglycerin, Polysorbate 20, Phenoxyethanol, Sodium Benzoate, Hexylene Glycol, Xanthan Gum, Potassium Sorbate. Q: How fast will this cream work? A: The cream is designed to work fast but there is no way to promise an exact number in days where all users will get the same results. The majority of users see visible lightening in just 1-2 weeks but everyone’s skin is different. We all live in different climates, have different ethnicities, practice different exfoliation techniques and have different levels of dedication to skin lightening. Some are serious about skin lightening so they exfoliate regularly, use the cream twice per day, avoid the sun and use sun protection. Others may use once per day and do nothing else. Clearly, the person who is more committed will achieve faster results than the person who is undedicated. Q: Does the 15X Super Bleaching Body Cream contain 15% hydroquinone? A: No. The 15X Super Bleaching Body Cream does not contain 15% hydroquinone. 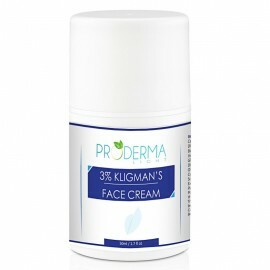 The cream is formulated with several skin lightening agents to make it very effective but it is not 15% hydroquinone. Q: I have very black/dark skin. Will this cream work for me? A: Yes. The cream is designed to lighten even darker skin tones. Q: Can I use this cream to remove burn marks or scars? A: The 15X Super Bleaching Body Cream TM can fade dark spots but lightening creams usually cannot remove burn marks, hypertrophic scars, keloid scars or any type of raised scars. Q: What is the difference between the 15X Body Cream and the 10X Face Cream? A: The 15X Body Cream is specifically formulated for lightening the body. The skin on the body is thicker and harder to lighten than the skin on the face. The 15X Body Cream has a stronger concentration of ingredients than the 10X Face Cream. Q: Does the cream contain any mercury or steroids? A: No. None of our products contain mercury or strong steroids. Q: How long should I use the cream? A: You can use the cream for as long as it takes to achieve results. Q: Can this cream be used by men? Q: Is this cream fragrance free? Do not use this product if you have impossible or unrealistic expectations. Not suitable for ultra-sensitive skin types. If irritation occurs discontinue use. This product contains alpha hydroxy acids (AHAs). Use adequate sun protection and avoid extreme sun exposure when using this product. If pregnant or lactating consult a physician before use. For topical use only. Do not ingest. Do not use on lips or in genital areas. wow!! All I can say is wow this cream is the holy grail of all lightening creams! I used this cream consistently and I have gotten the BEST RESULTS!! 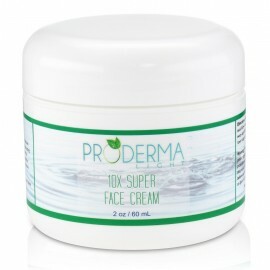 Proderma 15 X Super "The Bomb"
I've used proderma 15X super for over a year. This cream gives fast results, smells nice and does exactly as describes. "Works". My extremities are exceptionally darker than than the rest of my body - it is most obvious when looking at my face (4 shades darker) and my neck (uniform with my body). I have been using this product for years and after just 3 days, I start seeing results and within 2 weeks, my complexion is vastly more even and uniform. There simply is NO substitute for this product if you are looking for fast, effective, and consistent results! Yes I try this product and I love it. When can I order it again.